Jerry & Anita Spencer's Dendrobium Little Saigon wins Spring Show Sweepstakes Trophy for Best of Show"
Our Purpose: To promote interest in orchids and their cultivation, to educate by exchanging information and experiences related to successful orchid culture , and to support the conservation of orchids in the wild. 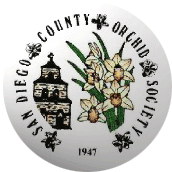 Please click here for information about joining SDCOS. We encourage you to join the Society to receive the monthly newsletter and many other benefits. Please click here for email subscription service. Meetings: Meetings are held the first Tuesday of each month at Casa del Prado in Balboa Park. Admission is free - everyone is welcome. Culture Class is at 6:30 p.m. in Room 101. The General Meeting is at 7:30 p.m. in Room 101. Calendar:We have events throughout the year. To see the Calendar click here. Shows: Shows are held four times a year. The Annual International Show for 2019 will be held at the Scottish Rite Center March 22nd, 23rd, 24th 2019. There will be a modest charge for entrance and parking is free! We rely upon Adobe Reader. Get it here!